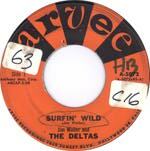 Jim Waller and the Deltas were from Fresno, California. They were miles from the surf physically, and their sound was much more about the west coast jazz club combo sound than surf. This single was from their Surfin' Wild album.